Over the last eight years, EDC Orlando has blossomed into one of the largest destination festivals on the East Coast. The Sunshine State has shown us just how warm that Southern hospitality can be, as more and more Headliners join our extended family in Florida. This community has grown so much, we had no choice but to expand the experience in 2019 to include three full days of fun in the sun. You read that right: EDC Orlando has added a third day to its run this November, which means you can squeeze in another unforgettable night Under the Electric Sky! To make matters even more bright and shiny, the ninth annual EDC Orlando happens to land on a holiday weekend—November 8–10, to be exact. With the Monday following the three-day extravaganza being a holiday, you won’t have to sweat taking off an extra day from work and/or school. Score! For our out-of-state and international folks, traveling to the festival has never been more seamless. We have partnered with our friends at Festicket to introduce a whole host of experience packages that include hotels, transportation, crazy off-site activities, and so much more. There are plenty of options to choose from, depending on how much you want to take advantage of your stay at the theme park capital of the world. 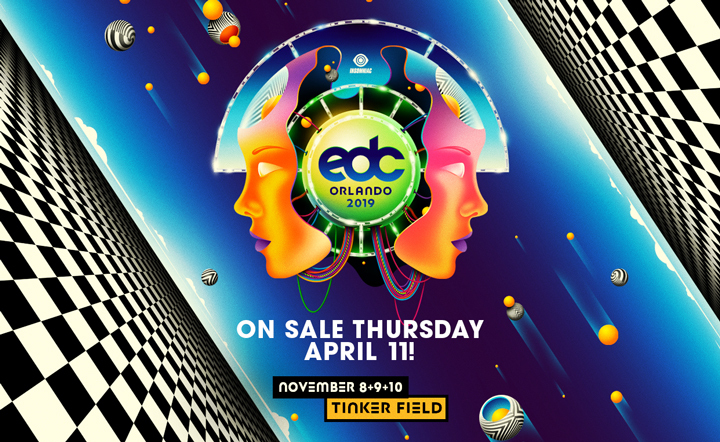 EDC Orlando takes place Friday, November 8 – Sunday, November 10, at Tinker Field in Orlando, FL. Tickets go on sale on Thursday, April 11.